= Stenocactus multicostatus subs. zacatecasensis (Britton & Rose) U.Guzmán & Vázq.-Ben. 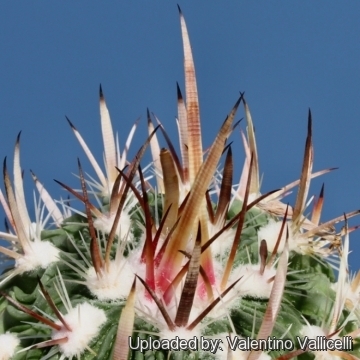 Plant catalogued as "zacatecasensis" have (usually) characteristic long , white, red or black papery spines and thin wavy ribs. The blooms are very pale pink or white with a purplish midvien. Origin and Habitat: Mexico (north Zacatecas). 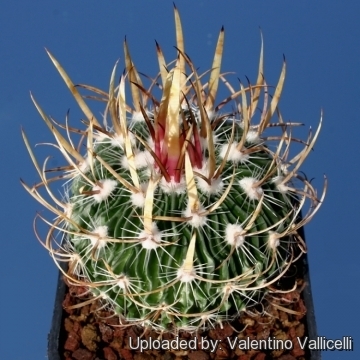 Description: Stenocactus multicostatus subs. 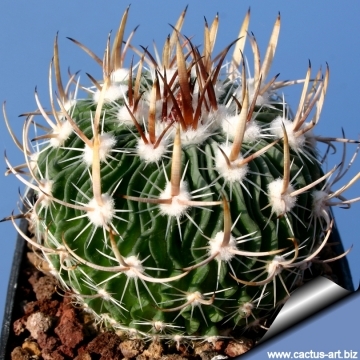 zacatecasensis (Echinofossulocactus zacatecasensis), is a globular cactus with several densely packed, sharp, wavy ribs and three brownish, not annulate central spines of which the middle one is flat. 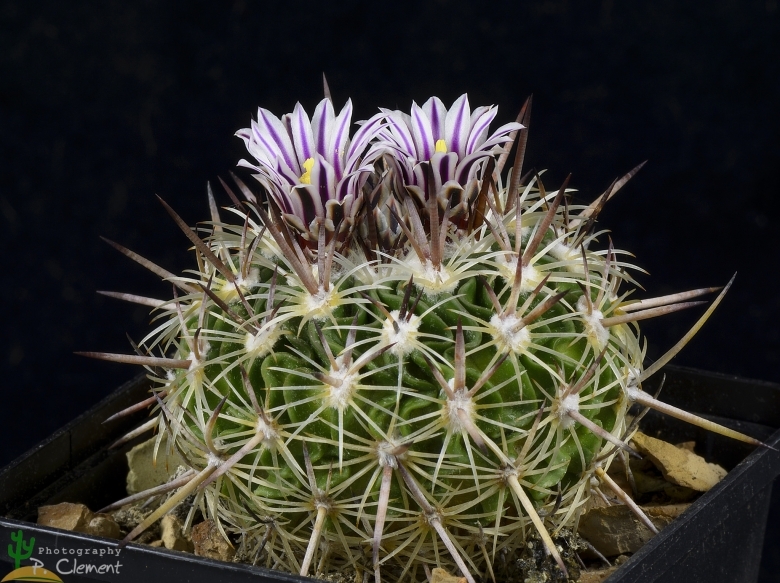 It is generally included within (as a synonym of) Stenocactus multicostatus, suggesting that there is not really a fundamental difference between the two. It has flowers nearly white or with a pink mid-vein and the apex of the plant umbilicate. 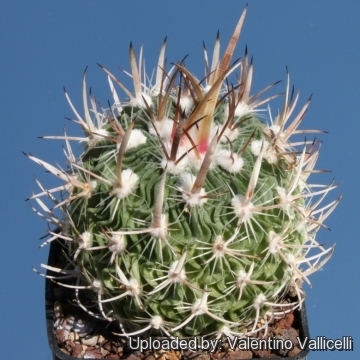 However the distinguishing characteristics of this plant, appear to fall within the natural variation of Stenocactus multicostatus and most authors have dismissed it as perhaps not worthy of even varietal status, but it still has a value for a collector because they identify plants with particular characters. Derivation of specific name: “zacatecasensis” for the occurrence in the State of Zacatecas, Mexico. Stem: Solitary, globose, pale green with an umbilicate top, 8-10 cm wide and tall. Ribs: About 55, wavy, tight and very thin. Areoles: Covered with white felt in young plants. Radial spines: 10 to 12,acicular, white, 8-10 mm long radiating usually cream-white. Central spines: 3, brownish, 2 of them terete, but the middle one flattened, erect or connivent, longer than the other 2, sometimes 3 to 4 cm (or more) long, never annulate. Flowers: 3-4 centimetres broad, nearly white or with a pink mid-vein. Inner perianth-segments linear-oblong, with an ovate apiculate tip, slightly tinged with lavender, 15 mm long. Style slender. Stigma-lobes bifid. Scales on the ovary broadly ovate, apiculate, scarious. Cultivation and Propagation: Small growing and easy to to care and flower. Because of it’s small size makes a great potted plant specimen, great for beginning collectors. 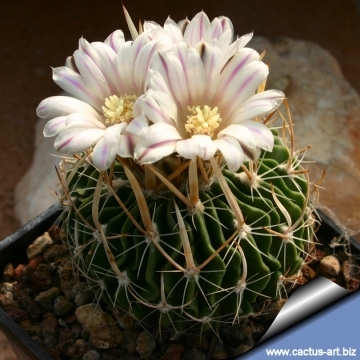 It needs regular cacti soil with good drainage. Propagation: Seeds (usually) or by the shoots of adult plants (if available). Exposure: need some direct sun but is tolerant and prefers light shade during the hot Summer months, allow to dry between watering. Watering should be curtailed during the winter months. Frost Tolerance (-6 to -4°C) depending on the form.